People often ask, when considering moving to Costa Rica, “What about the Costa Rica insects? Are they a problem? Are there a lot more than where we live now?” and so on. The basic answer is that it depends on where you live in Costa Rica and where you live now. Costa Rica insects can be mysterious and amazing! I have lived in 5 different areas of Costa Rica for over a month at a time – some 4-6 months, and currently almost a year where we are now. So I can tell you that it really does depend on where you live. And like most things in Costa Rica, it can even be different less than a kilometer away. I lived on the outskirts of San Jose for a while and I’ve heard horror stories about the cockroaches there. However where I lived I saw nary a cockroach nor any other bug! For real! I was surprised and delighted! 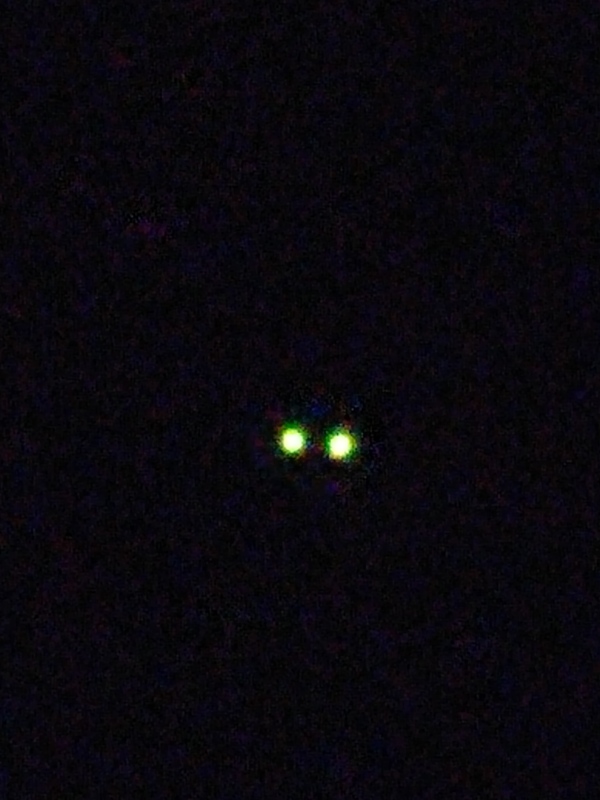 The flying bugs were only bad at night when I had to use electric lights. Tiny little bugs would come in and fly all around and they were so bad I’d just want to get in bed under my mosquito net (oddly, mosquitoes were not much of a problem at all) and read with only a book light on because if I had any other lights on the bugs were thick and annoying. The ants in Montezuma were so bad that if you cooked and you dropped even the tiniest of crumbs of any kind of food on the floor, hundreds of ants would swarm almost immediately to eat the food. Then if you didn’t clean the counter 100% well you’d find them up there later. I had to keep the place super clean like a hospital in terms of food or else there was a problem. I tried finding where they were outside and spraying them with various types of ant poison but it made zero difference. Finally, I just learned to co-exist with them. Where we live now, outside San Ramon, we see lots of bugs because we live next to a forest on one side and a farm on the other. However, the bugs are mostly benign and actually aren’t bad at all. I was actually afraid they’d be a problem when we moved here but in fact it’s not much of a problem at all. We do see lots of Costa Rica insects though. Occasionally we see spiders and my policy is “if you’re an uninvited guest in my house and I don’t like your looks, you are likely to get killed”. So we kill a spider or two every day. None are poisonous, but some are ugly and some do bite and leave itchy bumps behind. We see scorpions once in a while but we are closing up all spaces where we find them coming in and little by little we are diminishing their presence in the house. Again, they are not lethal or really dangerous but I do hear they HURT LIKE HELL. I’ve heard their bite described as like hitting your hand hard with a hammer, and the pain lasts an hour or two. I have heard also that it depends on which scorpion bites you so not all may hurt that bad. Believe me, no one likes finding these in or around their house. BUT if you live in a place where they are around, you will get more used to them. LOL. We see one, we kill it, we move on. That’s pretty much it. Just like any other disgusting insect like a spider or cockroach. Costa Rica probably isn’t for you! We see almost no ants inside our house except these big long thin ones that send scouts into our house every so often. They’re easy to see so they have not moved in with any force so far because as soon as we spot one he’s a goner. Surprisingly none have gone after our food at all so far (knock on wood 3 times). 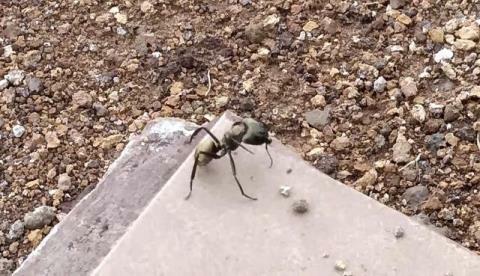 Here is one we’ve seen outside called a Tiger Ant. Huge and scary looking. Thank goodness we’ve only seen one. It’s really big and fairly harmless except you don’t want to be bitten by it! My policy is – and I recommend this to you as well – if it’s in or around your house, and you’re not sure it’s good, kill it. There are more where it came from so you don’t want to make them feel too welcome! As far as I know there are no ants, scorpions, spiders or cockroaches around here on the Endangered Insects list (if there is such a thing)! If you know of any that are please post them below! And that’s about it really as far as inside the house goes: a spider, an ant and a scorpion here and there; not many at all and we are sealing the house against them little by little each time we find a hole where they can get in. Oh, and there was one short season of a few weeks in June when there were tons of little moths outside and they would swarm around the windows when they saw the inside lights and try to get in. Luckily the window was sealed well and so they didn’t get in except a few here and there. But one time there was a hole above the shower window that I didn’t know about and I went in the shower and turned on the light and within about 3 seconds there were suddenly about 20 moths flying around in the bathroom. I have since plugged up that hole. For the most part we enjoy the insects in an odd way – that is, we enjoy seeing them when they are outside! There are so many new insects we’ve never seen before and some are amazing. We saw a glow worm for the first time. I don’t know what the actual name of them are but they’re little short 1/4″ long worms that you can spot on the ground at night because of their yellow glow. Pretty cool! Our favorite insects so far have been the “carbuncos” as they call them here. They are basically lightning bugs on steroids! 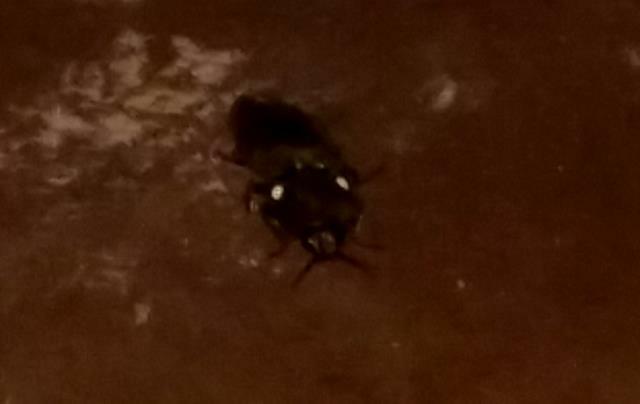 They’re about 4 times the size of the lightning bugs we knew in the states and they have 2 spots on their head that look like eyes but are not, and which glow very very bright. Also when they fly they keep their light on much longer than a regular lightning bug. We have both – the regular lightning bugs and the carbuncos. The carbuncos are really amazing to see and are by far our favorite insect here! We have praying mantises around, various types of beetles, and some really weird looking caterpillars. One beetle we see sometimes outside is very big and has a horn on his head like a rhinocerous. 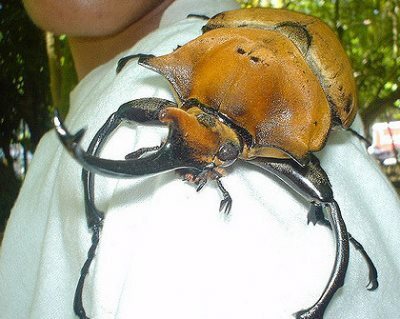 But thank goodness we do not have these huge rhinocerous beetles around here (at least we haven’t seen any)(they’d be hard to miss – see photo below). This is one of the Costa Rica insects I definitely don’t want to see around my house! 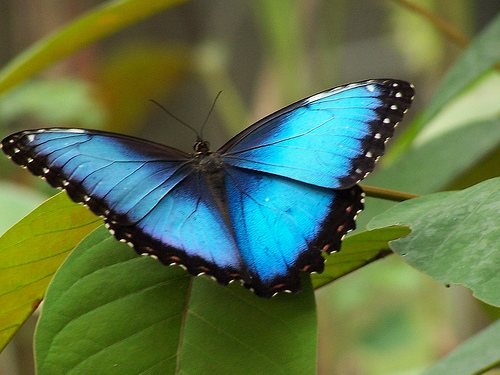 We do, however, have morpho butterflies that are the size of birds with maybe a 6″ wingspan! Really fun to see! Some are big and a beautiful blue but the bigger ones are black. We have insects outside on our 9 acres that are too numerous to report! We find them interesting and amazing to see as there are many unique Costa Rica insects that we’ve never seen before. 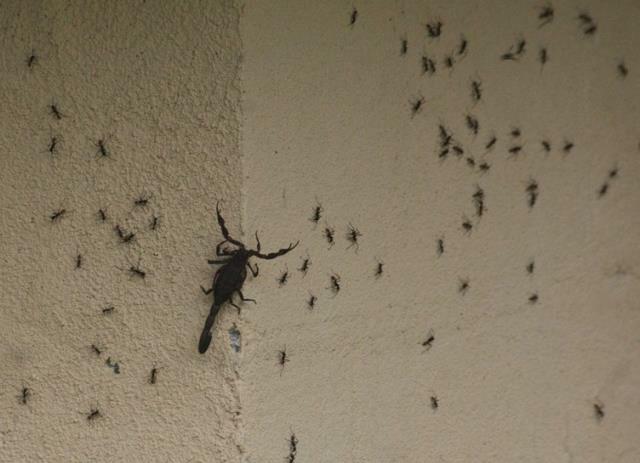 Our most interesting experience was seeing the “marabunta” or army ants at a neighbor’s house. They come in droves and look for dead insects or anything like that to eat – not human food. My neighbor says he loves it when they come because they clean his house of insects in an hour or two and then leave, thank you very much! It is amazing to see these Costa Rica army ants thousands of them at a time and they turn the wall black as they form themselves in an “army” of ants on a mission: to find insects in your house and eat them! It’s really something to see. Though personally I’d just as soon they visit other people’s homes – I’ll deal with my insects myself! So there you have it, the good, the bad, the ugly and the beautiful of Costa Rica insects! You can learn more about Costa Rica insects at this link. LOVE that butterfly – HUGE too. I want to communicate with you about the use of Panacor SIPS. Robert, I sent you a private email. Hope you got it! Let me know if you didn’t. Good protein, goes well with scrambled eggs, adds just the right touch of hot spice. I have heard of eating rattlesnakes and iguanas but scorpions – seems like they wouldn’t have much meat on ’em! LOL. Thanks Bill! I know in Mexico some people eat grasshoppers! Deep fried! I ate squirrel, rabbit and deer as a kid, but that’s as far as I’ve gone. Now a vegetarian for many years. But wait, can vegetarians eat insects? Well surely I could! But I choose not to, thank you very much! 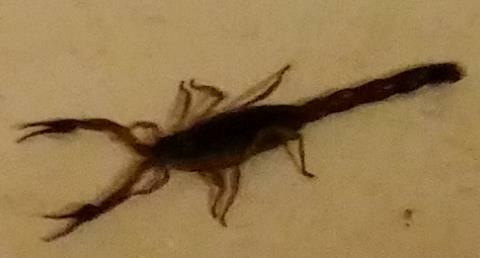 Wait, is a scorpion an insect even?